Do you ever feel intimidated by wine? Whether it's ordering at a restaurant, going to a Tasting Room, or drinking with "wine knowledgeable" friends, for some reason we can all get a little worried. At Brooks, we hate hearing things like that. Wine is supposed to be fun. Wine is supposed to relieve stress, not cause it. We're here to help with our new Wine 101 Class: See, Smell, Sip. In this fun, engaging, and LOW STRESS environment, Lauren will guide you through wine tasting basics broken down into SEE, SMELL, & SIP. 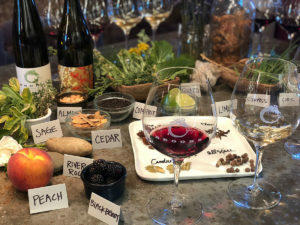 With this bedrock of information, you will be given two red wines and two white wines as you explore four key wine concepts, ACID, FRUIT, SWEETNESS, & TANNIN, comparing these components with foods that you already know (for example, lemon and acid). With your brain full of intimidation-crushing knowledge, you will revel in a veritable playground of smells and tastes as Lauren will lay the table with everything from rocks and soil to herbs, spices, and fruits. You can then smell, taste and compare, leaving the tasting with scent and flavor memories that will carry over to every wine you drink in the future.